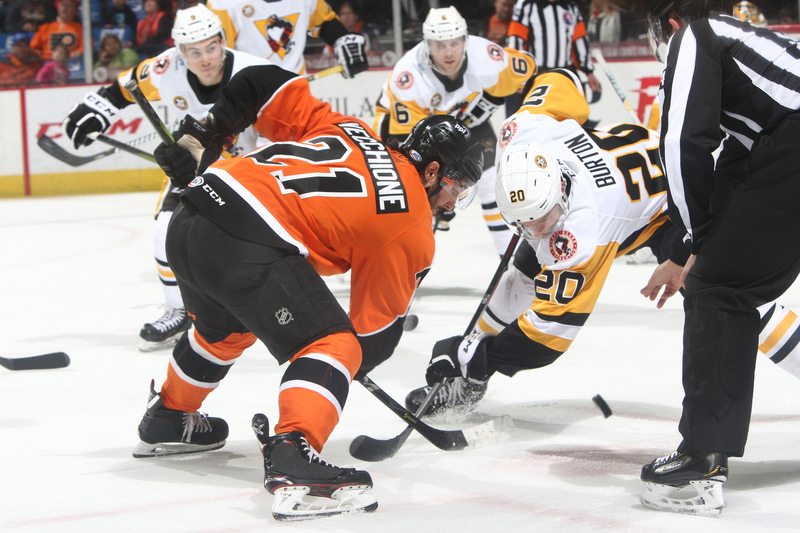 Lehigh Valley, Pa. – The Lehigh Valley Phantoms (32-27-4-3) battled hard to earn a point against the Wilkes-Barre/Scranton Penguins (31-25-7-3) but eventually fell in overtime 5-4. The Phantoms fought to overcome a two-goal deficit and got goals from Philip Samuelsson, Greg Carey, Cole Bardreau, and Byron Froese in a hard-hitting rivalry matchup inside a soldout PPL Center. For the second straight night, the Penguins were able to get on the board first. Sam Miletic entered the Phantoms zone and threw a saucer pass over to Sam Lafferty streaking down the middle. Lafferty flipped a backhand shot that beat Lyon short side to give the Penguins a 1-0 lead. Lehigh Valley was quickly able to answer, tying the game just 28 seconds later thanks to Philip Samuelsson. With a delayed penalty call, Alex Lyon got to the bench for an extra attacker and the Phantoms’ were able to cash in. Good puck movement gave Mark Friedman a shooting lane and he fired one on Jarry. The Wilkes-Barre netminder was able to make a pad save but pushed the puck right to Samuelsson who buried his fourth goal of the season into the open net. Things once again got very chippy between these two Keystone State rivals as the first period went on. With Wilkes-Barre/Scranton on a power play, Joseph Blandisi was able to give the visiting team the lead back with 2:44 left in the period. Sam Lafferty made a nice move to stick-handle through a couple Phantoms’ defenders and then threw a saucer pass across the ice. Blandisi was waiting in the right circle and hammered a one-timer to give the Penguins a 2-1 lead. Wilkes-Barre/Scranton extended their lead to two halfway through the second off of Sam Lafferty’s second goal of the game. Ryan Haggerty circled between the Phantoms’ net and fed one to Lafferty in front who was able to sneak one through the five-hole of Alex Lyon to make it 3-1. For the second time tonight, Lehigh Valley responded less than a minute after a Penguins goal and cut the deficit to 3-2. Greg Carey unloaded a shot point-blank that drilled Jarry right in the mask but stayed out. David Kase got the rebound and gave it right back to Carey and the hardest shot in the AHL would not be denied twice, as he scored his team-leading 27th goal of the season. Cole Bardreau evened the score again with 3:45 remaining in the second period. Steven Swavely made a spin-o-rama pass to Bardreau in front of the net and he was able to redirect it by Jarry to tie the game 3-3. The goal was Bardreau’s fifth of the season and first since returning from injury, with his last tally coming on November 24. The Phantoms scored their third unanswered goal to take their first lead of the game 6:08 into the third period. The recent Penguins-killer Byron Froese scored his third goal with Lehigh Valley, all of which have come against Wilkes-Barre/Scranton. Reece Willcox threw a puck into traffic in front of Jarry and Froese was able to stuff the loose puck home to give the Phantoms a 4-3 lead. With an empty-net for the Penguins, Wilkes-Barre/Scranton tied the game with less than a minute remaining as Sam Lafferty completed the hat trick. Ryan Haggerty gave the Penguins the second point with his overtime winner 1:02 into the extra period. NEXT TIME OUT: The Lehigh Valley Phantoms will hit the road for a long 10-day road trip, beginning Wednesday in Rochester. The Phantoms 1-0 against the Amerks this season after a 3-2 shootout victory in PPL Center on January 19.